Every crime warrants condemnation, but this particular robbery will make you question your faith in humanity even more. 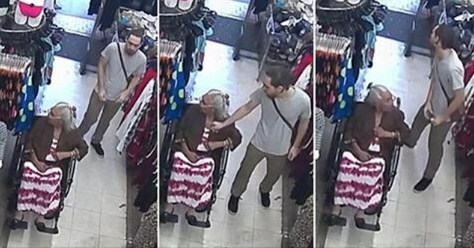 A CCTV camera in a New York City store caught a man stealing from a 93 year-old woman in wheelchair. According to reports, the woman had just cashed her Social Security check when the unidentified man see her put the money inside her bra. In a video tweeted by @NYPDnews, a man can be seen approaching the woman in a wheelchair from behind. He then proceeded to grab the money concealed inside the woman's bra and immediately flew. The woman, who was in the store to shop for sandals alerted the store staff, but the man had already left the store. The New York City Police Department is now searching for the man in the video who is believed to be approximately 35 years old. The individual is a male, Hispanic, approximately 35 years of age, 5’10”, 160 lbs., light complexion, brown hair, last seen wearing a gray shirt, black sneakers, tan jeans and a tan bag. All call are strictly confidential. The Police are also reminding that every tip will be deemed confidential.